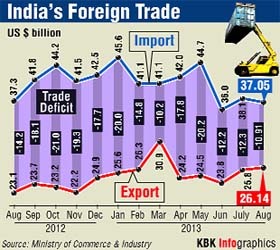 India's exports rose to a two-year high of 13 per cent in August on account of improved global situation, enabling trade deficit to fall to a four-month low of $11 billion, aided by subdued gold imports. The rupee today closed above the 64 mark at 63.84 against the dollar, up 140 paise — the biggest in two weeks — as fears of a US military strike on Syria eased amid lower global oil prices. Apple's latest iPhones will come in a bevy of colors and two distinct designs, one made of plastic and the other that aims to be "the gold standard of smartphones" and reads your fingerprint. Apple CEO Tim Cook at the launch in California on Tuesday. A strengthening rupee and global fall in gold prices have caused investors to dump the yellow metal making it attractive for retail buyers to re-enter the market during the forthcoming festive season. Snapping a nine-month streak of decline, domestic passenger car sales grew by 15.37 per cent to 1,33,486 units in August this year, compared to 1,15,705 units in the same month last year. Indian partner of McDonald’s north and east operations in the country Vikram Bakshi has approached the Company Law Board (CLB) against his removal as the managing director of the joint venture. Toyota has reissued a recall of 870,000 vehicles in the US and Canada after discovering initial repairs were not performed properly, the Japanese automaker said today. "We got reports there was a problem with vehicles that had supposedly been fixed in the initial recall," spokeswoman Cindy Knight said. Led by Bharti Airtel, telecom stocks today gained as much as 8.15 per cent as sector regulator TRAI recommended a sharp cut in the floor price of mobile phone spectrum for an upcoming auction after two previous sales drew lukewarm response on high reserve price. 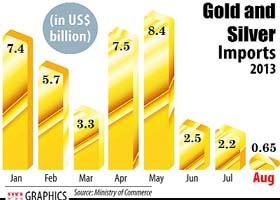 Gold imports, which has been pushing up current account deficit and putting pressure on rupee, dipped to $0.65 billion in August from $2.2 billion in the previous month. Exports, for the second month in a row, increased by 12.97 per cent to $26.14 billion, while imports declined by 0.68 per cent to $37 billion. "Things are improving in Europe and in the US also economic condition is better. So signs of stability in the major economies, including the UK, and the positive growth in the US will lead to increase in demand," Commerce and Industry Minister Anand Sharma told reporters here. He also said new markets like Asia-Pacific, Africa and South America have helped in pushing India's exports. The minister expressed hope shipments would continue to be in the positive zone for rest of the financial year. All the exporting sectors barring jewellery have shown positive growth in August. Sharma said the government will further extend incentives to those exporting sectors which are lagging behind. "...we will take a considered view and make intervention to support those sectors which are lagging behind, and that we shall do it after the review in October," he said. During April-August, exports were up by 3.89 per cent at $124.42 billion. Imports too grew by 1.72 per cent to $197.79 billion, leaving a trade deficit of $73.36 billion. Oil imports in August grew by 17.88 per cent to $15.1 billion. The last time trade deficit had narrowed substantially was in March when it touched $10.3 billion. Trade deficits have been fuelled by high imports of gold and crude oil, contributing to the widening CAD, which touched an all-time high of 4.8 per cent of GDP, or $88.2 billion, in 2012-13. However, non-oil imports declined by 10.4 per cent to $21.9 billion, the minister said. Sharma expressed hope that trade deficit will decrease this fiscal from the previous fiscal's $191 billion. Besides putting curbs on gold imports, the government is also taking steps to boost electronics manufacturing to reduce its imports. Last year, India imported electronic goods worth $32 billion. "We are looking at all possible means to take up manufacturing of all electronic products. IT investment regions have been developed. Japanese industry is very keen to establish dedicated electronic parks. Until we start manufacturing, this is (increasing electronic imports) also a drain when it comes to imports," he added. To a question, he said government cannot curtail these imports till chip manufacturing units start operations. He also said the Commerce Ministry is working on ways to restrict imports of non-essential goods. According to the minister, high coal imports have also pushed trade deficit and CAD. He also said the commerce ministry is currently engaged in preparing an internal projection figure. Banks and exporters preferred to reduce their dollar positions on expectations of additional foreign fund flows into the equity market. The rupee resumed higher at 64.40 a dollar from Friday's close of 65.24 and touched a low of 64.54 at the interbank foreign exchange market. It later bounced back to breach the 64 mark and touch a high of 63.78 before settling at 63.84, a rise of 140 paise or 2.15 per cent. Today's rise was the biggest since it added 225 paise on August 29. In four straight sessions, the local currency has flared up by 379 paise or 5.6 per cent. US jobs data on Friday fell short of expectations, leading to speculation that the tapering of the US Federal Reserve's bond-buying programme would be delayed. 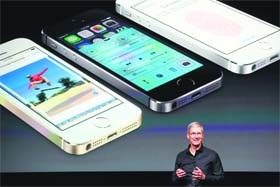 Apple unveiled the latest iPhone models during an event at its Cupertino, California, headquarters. The move comes as rival phones from Samsung and other manufacturers are challenging Apple’s hold on the smartphone market. The iPhone 5C will be available in five colours —green, blue, yellow, pink and white. CEO Tim Cook calls it "more fun and colourful" than any other iPhone. The 5C has a 4-inch Retina display and is powered by Apple's A6 chip. It also has an 8 megapixel camera, live photo filters and a rear cover that lights up. The iPhone 5C will cost $99 for a 16 gigabyte model and $199 for a 32 gigabyte model with a two-year wireless contract. The phone is expected to help Apple boost sales in China, India and other areas where people don't have as much money to spend on new gadgets as they do in the US and Europe. The second phone, the 5S, is "the most forward-looking phone we have ever created," said Phil Schiller, senior vice-president of worldwide marketing at Apple. It will come in silver, gold and "space gray" and run a new chip, the A7 that is up to twice as fast as the A6. Schiller said the new phone can run more health and fitness applications. These apps have become increasingly popular as more people use them to track exercise routines, calorie intake and even sleep patterns. The camera in the 5S received some major upgrades, including several automatic features designed to produce better photos. It has larger pixels, which helps capture more light. The phone also has a two-tone flash feature that is designed not to clash with the colours in the room or a person's skin colour, something Schiller said has not been done on a phone before. The camera, called iSight, has "auto image stabilisation," which helps avoid blurry pictures, and a slow-motion camera for video. The 5S also includes "Touch ID," which reads fingerprints at a "detailed level," Schiller said. He said it is "fun and easy" to teach the 5S about your fingerprint and once you do, you can just touch the home button to unlock the phone. Tying the fingerprint scanner to payments could also open new revenue channels for Apple. Apple also said its next mobile operating system, iOS 7, will be available as a free download on September 18. The 5S is the most forward-looking phone we have ever created, said Phil Schiller, senior vice-president of worldwide marketing at Apple. Gold futures for October 5 fell to Rs 30,988 per 10 gram, a decline of 1.75 per cent, today. Investors feel gold prices in the Indian market could decline sharply if the rupee continued to gain against major international currencies. The rupee closed above 64 to the dollar today. "While gold prices are softening in the global markets, the fall would be sharper in India if the rupee gains against the dollar," says Arvind Srinivasan, a city-based analyst. India has been tightening imports of gold in order to reduce its current account deficit. According to data announced today, India's gold imports crashed 95 per cent in August to just 2.5 tonne from the month before. On the other hand, imports of the yellow metal in July amounted to 47.5 tonne while April and May saw 142.50 tonne and 162 tonne, respectively, of the yellow metal being imported into the country. In the past few weeks, the Indian government has been increasing duties and also tightened rules governing import of gold by jewellers. Financial institutions have also stopped issuing new Exchange Traded Funds that allow investors to buy gold in de-materialised form. However, jewellers feel any fall in gold prices below the psychological Rs 30,000 per 10 gram mark would cause a spurt in demand by retail buyers. "The festive season and the marriage season will start from next month and this will see a big demand for gold. If the price falls by then, a lot of people who had postponed purchases of jewellery will begin buying," says Sundarlal Jhaveri, a jeweller at Opera House in south Mumbai. The buzz in the market is the current month will see record gold imports as jewellers try to replenish inventories ahead of the festive season. Industry body Society of Indian Automobile Manufacturers (SIAM), however, played down the feat saying the growth was mainly due to low base effect as a result of the month-long lockout last year at the country's largest car maker Maruti Suzuki India (MSI) Manesar plant. "This (growth) is not a reflection of the market conditions. 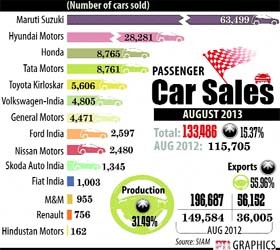 This is mainly due to Maruti's numbers compared to last year. The tough market conditions still remain. Interest rates are high, fuel prices continue to be high while sentiments are extremely low," SIAM deputy director-general Sugato Sen said. He said the positive growth seen in August is unlikely to be sustained in September and a recovery in the market is likely to happen only in the next couple of quarters. “For this fiscal, we are staring down at a negative growth of car sales. If we have to match last year’s 2.7 million units, we need to be selling over two lakh units each month but in the last three months, we have sold less than that,” Sen added. In August, market leader MSI doubled its domestic car sales at 63,499 units as against 31,653 in the same month last year. The company had declared a month-long lockout at its Manesar plant in August 2012 following a violent labour unrest in which a senior executive was killed. Hyundai registered a marginal increase during the month at 28,281 units as against 28,192 units last year. Tata Motors saw its sales plunge by 50.57 per cent to 8,761 units as against 17,727 units in August last year. Mahindra & Mahindra saw its domestic passenger vehicles sales decline by 25.45 per cent to 18,137 units during the month. In his petition to the CLB, Bakshi, ex-managing director and partner of McDonald's joint venture Connaught Plaza Restaurants Pvt Ltd (CPRL), accused the American fast food chain "of implementing a pre-determined scheme of attempt to take over the Company (CPRL) in a coercive, oppressive and illegal manner contrary to law". Incorporated in June 1995, CPRL is a 50:50 joint venture between McDonald’s Corporation and Vikram Bakshi and it has been running fast food outlets in North and East India. Bakshi claimed that since 2008, when the JV started making profits McDonald’s has been trying to buy him out of the company. The first offer was made in August 2008 for $5 million, which he said was "categorically rejected". "It turns out dealerships weren't performing the repairs correctly." Toyota has issued new instructions to dealers and will be notifying customers they need to bring their vehicles back in to be checked. Toyota said it found that the rear tie rod could develop "unwanted movement and rust" if the nuts are improperly tightened during service.